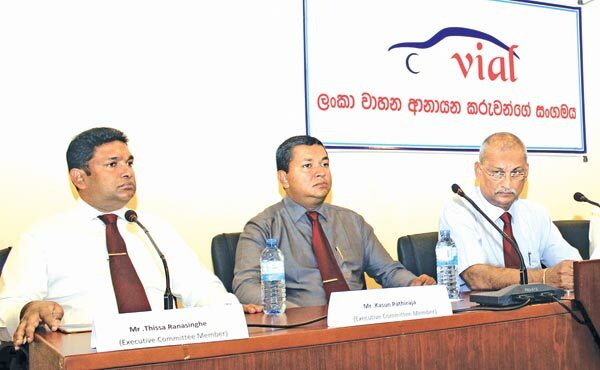 Motor vehicle registrations has come down by 60% and tax income to coffers from vehicle imports has fallen short of government expectations, the Vehicle Importers Association of Lanka (VIAL) said in Colombo yesterday. Although there is speculation that the prices of imported vehicles may be affected from the government’s second budget scheduled to be presented on November 10, VIAL says they expect no change in the prices of vehicles. VIAL also said the rumours circulating among the public that there will be a reduction in taxes imposed on imported vehicles by the government was baseless. VIAL Chairman Indika Sampath Merenchige said the Finance Minister had given the association a pledge that there will be no change in taxes on imported vehicles for a period of two years. The Minister has reiterated that he will honour the promise given in May that there will be no changes in imported vehicle taxes for two years.Therefore other than rectifying any irregularities that may exist in the valuation method of vehicles, it is very much unlikely that there will be any affect to the prices of vehicles from the forthcoming budget. Therefore the perception that there will be a reduction in vehicle prices after the budget is entirely incorrect and a misperception,” Merenchige said. VIAL Secretary, Keerthi Gunawardane however cautioned that the prices of small vehicles less than 1000 cc engine capacity may rise from about Rs 2 to 300,000.Gunawardane said only 20% own a vehicle in Sri Lanka and it was important that the government understands the needs of the people rather than curtail the vehicle market. Gunawardane requested government not to arbitrarily increase the prices of vehicles in a ill logical manner. For example Gunawardane said a tax of seven million has been imposed on the hybrid Toyota Prius which is double the value of the car. With regard to the lease ceiling of 70%, Gunawardane said they have made submissions to the government to relax ceiling to at least 90% with regard to high quality vehicle of Euro Standard four or above. He also alleged that vehicle registrations year on year has reduced by 60% and the government had failed to achieve its tax revenue goals with regard to vehicle imports. The association also said the fee of 15,000 charged when raising letter of credits was totally unjustifiable and requested removal of that levy. Importers also expressed optimism that the prices of electric vehicles will come down in the budget. VIAL, Treasurer Franklin Fernando said the government must be mindful that 45% of its tax revenue was from vehicle imports.The association points out that there were yet vehicles available in the market that was imported to the country prior to April, before the hike of import taxes. These vehicles can be obtained for the same old prices, the association said. Therefore taking account of the possibility of the Yen appreciating further and the price of vehicles increasing, this was the ideal moment to purchase a vehicle for a cheaper price, representatives of VIAL said. “Due to import taxes imposed on vehicles with the engine capacity beyond 1,500 CC increased substantially last April, vehicle importers had to re-export vehicle that were under order at that time. Although after the increase of taxes vehicle importers increased the prices of vehicles by Rs 4 to 500,000. However due to the decline in demand by customers because of the high price, vehicle vendors have decided to sell their vehicles for the same old prices. There are vehicles yet available in the market that have been imported to the country prior to the increase of taxes in April 2016.These vehicles are sold for the same old prices in the market. It is very evident today that the Japanese Yen is appreciating in value by the day. In the recent past the Yen has appreciated about 10% in value. It is also speculated that in the future the Yen will further appreciate in value. It the Yen continues its upward trend the money that will have to be spent to import vehicles will further increase. As a result with vehicle imports further declining the price of vehicles in the market could increase further. Hence the volatility that exists in the market right now is very advantages to customers. Hence the most important message that we can give our customers is that to purchase vehicle at this advantages juncture without delay, added Merenchige.